Four Myths about Aphasia: BUSTED! The popular Discovery Channel television show, Mythbusters set out to prove and disprove common myths. During the show’s 13-year run, the hosts have tested plenty of popular myths! Since the show has come to an end without debunking the myths around aphasia, we will gladly take on that task to dispel some of the most common myths about this common language disorder. Myth Number One: If you have a stroke or brain injury, you will eventually plateau. One the most frustrating things to hear from a healthcare professional is that you or your loved one has reached a “plateau” in their recovery. For years, it was believed that any recovery would happen within the first six months. Debunked: FALSE! Research shows that while the rate and measure of progress will likely slow down, adults with aphasia can continue to make significant improvements, especially if they change their approach with on-going therapy, home practice (including a life participation approach), and healthcare treatment options. By focusing on reading, writing, speaking, and auditory comprehension daily, adults with aphasia can strengthen their skills. Debunked: FALSE! Aphasia is a language disorder. Aphasia can impact cognitive-linguistic skills like memory and problem-solving; however, it's so important to speak to and include the person with aphasia in all aspects of care, as overall intelligence remains intact. Myth Number Three: People with aphasia can’t speak, but they can read or write. Debunked: FALSE! Aphasia can affect all modalities (or methods) of language to some degree. Depending on the type and severity of aphasia, it can affect speaking, reading, and writing. When communicating with someone with aphasia, try different language modalities like speaking, writing, keywords, as well as non-linguistic modalities, like gesturing and drawing. 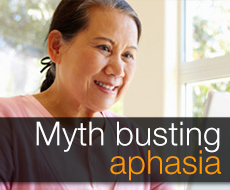 Myth Number Four: Only adults acquire aphasia. Debunked: FALSE! While it is true that your risk for stroke increases as you get older, stroke and brain injuries can happen to anyone at anytime, and so can aphasia. Because aphasia is a condition acquired as a result of a stroke, it can happen to babies, young adults, and the elderly. However, according to the National Stroke Association, up to 80 percent of strokes are preventable. Learn the signs and help stop stroke and aphasia before it happens. A big thank you to the Lingraphica Aphasia Users Group, Aphasia Recovery Connection, the National Aphasia Association, Stroke Tattler, Sarah B. Scott, and Herb Silverman for their input on this blog. Together, we will continue to debunk aphasia myths!